Johnny Bush’s career as a solo artist was taking off in the early ’70s when he came to a disc jockey convention in Nashville to sign a deal with RCA records. That’s where the Texas native met RCA executive Jerry Bradley, who planted the seed for “Whiskey River,” a song that would blossom into one of the best-loved — and most recorded — in all of country music. At the time, Johnny had already experienced sucess with a series of hits including, “You Gave Me a Mountain” and “My CUp Runneth Over.” Still, Jerry wanted him to write a very special song. Johnny picks up the story. But Jerry knew Johnny had a hit in him, and put the ball back in Johnny’s court. Johnny’s recording of the song went on to becoem a Top 15 hit, but his longtime Texas buddy, Willie Nelson, recorded it and made it a huge hit in 1978 — and his signature tune. In fact, Willie has recorded the song over twenty times. And it’s a good thing. The royalty checks from the song helped sustain Johnny through some lean years that resulted from a rare vocal disorder. “I’d jsut released ‘Whiskey River’ and it was climbing the charts when it struck,” he recalls. As a result, Johnny’s career took a serious downturn and it would be years before his vocal problem was correctly diagnosed and treated. Now he’s got a new album, Green Snake, and is back working as many dates as he wants to. 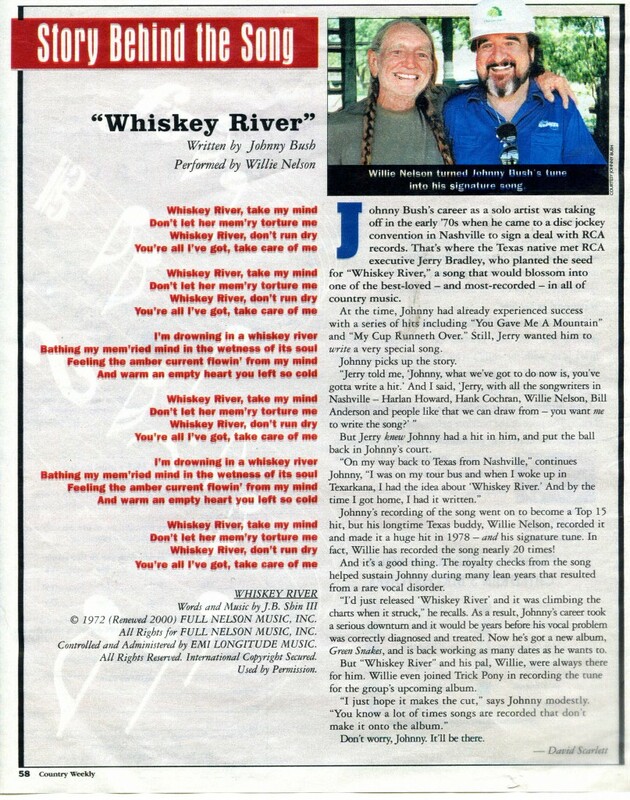 But ‘Whiskey River’ and his pal, Willie, were always there for him. Willie even joined Trick Pony in recording the tune for the group’s upcoming album. Don’t worry Johnny. It’ll be there. This entry was posted on Thursday, January 31st, 2019 at 5:01 pm and is filed under Johnny Bush, You Tube, Vimeo. You can follow any responses to this entry through the RSS 2.0 feed. You can leave a response, or trackback from your own site.